Tommorrow the folks at NASA will be holding a press conference to discuss "an astrobiology finding that will impact the search for evidence of extraterrestrial life." This notice has set off a flurry of spacey speculation about the potentially astronomical consequences of the announcement. People are predicting everything from a new scientific discovery that will aid in the search for life on other worlds to the impending return of an extraterrestial Elvis to conquer the world and turn it into one giant combination of Graceland and Las Vegas. Admittedly, that last one is a theory of mine. Since NASA has not been forthcoming with details about ther impending conference, speculation is all we have until tomorrow. So, here are my ideas for what just might happen when the cameras start rolling. DNA turns out to be directions to their place. The bedbug scourge is extraterrestial in origin. Aliens are sending us several thousand variations of "Uranus jokes." NASA reveals they've been tricked by NBC Public Relations into believing that "The Event" is a reality series. We're getting extraterrestial demands to reinstate Pluto as a planet ...or else. Alien life discovered on a meteorite accidentally mistaken for guacamole in NASA lab. NASA just wanted to apologize and to appeal to aliens for the receipe. NASA finally provides a rational explanation for the playtpus. Aliens are sending us back edited versions of I Love Lucy in which the Mertzes are "from out of town." Aliens have contacted Earth, demanding a "throwdown" with chef Bobby Flay. Alien lifeforms are sending audition tapes for "Survivor." NASA says that the tapes aren't really very good at all. NASA has discovered that supposedly advanced societies never got past their "disco" eras. Aliens want to take on Michael Jordan in a game of hoops, now that he's middle aged. Extraterrestials ask us to stop sending junk into space. They're sending back Voyager in a recycle bin. Aliens warn that Earth will be destroyed unless we stop beaming episodes of "Cake Boss" into space. NASA has discovered that random space static is actually the galaxy's most popular form of grunge music. Alien transmissions contain numerous references to the "leader of the Earth: Mr. Conan O'Brien." The press conference is mysteriously interrupted by a large mass of glowing swamp gas. *This explains much about the ex-Mrs. Burton's spacey personality. The winter wind was angrily gusting outside. Inside though, a fire was glowing in the fireplace and the family was gathered around the dinner table, awaiting a warm and comforting meal. The mother glided in to the dining room from the kitchen, confident in her culinary abilities, beaming with love for her family. The father sat at the head of the table, a smile of pride on his face. The adolescent son and little daughter leaned forward in their seats, hungry anticipation on their innocent faces. The mother set the platter down on the neatly set table and carefully lifted the cover off. The father nervously turned his eyes away. The children sank back in their chairs, faces suddenly exhausted. The little girl turned to her mother and with exasperation exclaimed, "You're giving us the bird again!" 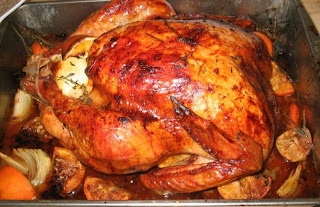 Yes, Thanksgiving week has come and gone and you've still got enough turkey in your fridge to feed the Kardashian family. It never fails. No matter how carefully you plan, no matter how much everyone enjoys that beautiful roast (smoked, or deep-fried) bird, when all is said and done and the relatives and other assorted guests have said their farewells, that enormous bird is still sitting there on the table, covered in meat. Turkey Skin Soup. Use every part of your turkey! Added bonus: When this soup develops a skin, it's real cooked skin! Treats for Santa. He'll eat anything! Break out those Christmas cookie cutters and fool the big guy! Fake mustache Use the stringier parts of the turkey for this one, folks. Secret hiding place for valuables. The last place any burgular will look is up your turkey. New breakfast cereal: "Frosted Sugar Coated Turkey Flakes! Your kids will gobble them up!" Props for an upcoming episode of Bones. In addition to Fox television producers, this can also apply to next year's Halloween costumes, for those of you with kids! Stuffing for some other kind of meat. "Wow, this pork chop is chock-full of roast turkey!" * Romeo And Juliet Act 2, scene 2. Seriously. ** Bet you thought we were talking about you until that last one, didn't you? *** That's what Cyber Monday refers to, right? Fortunately, our family has Old Glory Insurance! 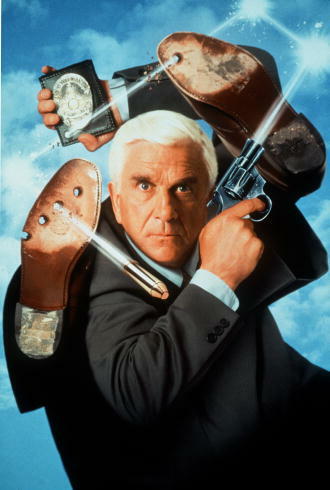 ... OK. "Something happened to Leslie Nielsen." Sadly, it's true. The beloved Canadian actor, remembered especially for his appearances in Airplane! and Police Squad, has passed on. When such a delightfully silly person leaves the world, it can't help but be a little less funny place to live in. R.I.P.